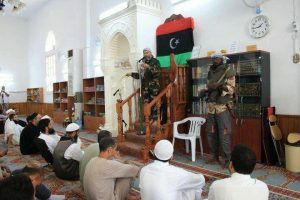 It is reported that the imam and preacher at the Ben Nabi Mosque in central Tripoli’s Mansoura district has beed arrested by the Rada (“deterrence”) force on suspicion of having links to terrorist groups. Abdel-Razzaq Mushaireb was seized outside his home in Mansoura yesterday evening. According to reports, the arrest followed investigations by Rada into Mushaireb’s activities, including allegations that he used the mosque to incite violence against those they damned as heretics and as a recruiting ground for the so-called Islamic State (IS). It is claimed that he had sent young men to fight for it in Sirte and Benghazi. The investigations are believed to be linked to those into the activities of the Manchester suicide bomber Salman Abedi and his brother Hashem. The latter, who was arrested by Rada along with their father Ramadan immediately after the Manchester bombing, is supposedly due to go on trial in November. It is also alleged that Mushaireb was involved with the Islamist youth movement Qudwati which Salman Abedi is said to have joined and which is accused being a covert conduit providing IS with fighters. Mushireb is said to be close to grand mufti Sadek Al-Ghariani and Tripoli Awqaf (religious endowments) office director Abdulbaset Ghwaila. Following the Manchester bombing, it was alleged that Ghwaila had links to the bomber’s father, although the Libyan Scholars’ Authority controlled by Ghariani has denied this. Ghuwaila’s son Awais was killed last year in Benghazi fighting with the radical Islamist Omar Mukhtar Brigade. He too had been involved with Qudwati. Rada, while strongly Islamist, is allied to the Salafist Madkahli movement. The movement and IS are deadly rivals.